1. Poncho offers the most convenient rain protection. On a monsoon trek the choice of rain gear may oscillate between an umbrella, a two piece rain suit and a poncho. An umbrella on a trek is as useless as an ejection seat on a helicopter. Sharp gusts of winds on plateaus play truant with the umbrella. Yet a far more serious repercussion of using an umbrella is that it ties up one of the hands. Keeping your hands free is essential on a slippery trail as it helps the body maintain its balance and free hands may help break a fall. A two piece rain suit provides the best wet weather protection. Yet on the flip side a two piece rain suit takes a lot of time to put on and take off. With most rain suits, you may have to take off your shoes to put on the rain pants. This makes the rain suit ineffective in a quick and heavy shower, the kind that you usually experience in the Sahyadri. A two piece rain suit also leads to a lot of moisture build-up due to inadequate ventilation, respiration and heavy humidity. A poncho is an invaluable piece of rain gear in the Western Ghats. A poncho on the other hand is a perfect compromise for the Sahyadri. It takes no more than 10 seconds to put on or take off. It keeps your backpack dry and it fits loose. The loose fit prevents moisture build-up due to perspiration and humidity. A poncho packs small and on our monsoon treks we keep a poncho tucked in our backpack's hip belt for quick access. Discarded sandals on trekking trails. On most of our Sahyadri treks we have seen and photographed numerous sandals discarded along trekking trails. Sandals are perfect for ventilation and for fording streams but they are not as robust as shoes. Unless you have a pair of dedicated trekking sandals like Salomon's Techamphibian 3 (Available on Amazon India) or Keen's Newport H2 (Amazon India) leave your sandals in your day / overnight bags. Salomon's Techamphibian 3 with robust straps and closed toe design but they are not exactly cheap. The slippery terrain on a monsoon trek, places a lot of lateral strain on the shoe especially if you slip. Sandal side straps are usually not robust enough to handle this lateral strain and may break under heavy stress. Furthermore, an open toe design sandal provides little to no protection against a stubbed toe. Despite these shortcomings, we do carry sandals on our monsoon hikes. Although, we only use them for stream crossings, as camp shoes and when walking through a gentle terrain in a really heavy downpour. Remember a broken sandal can effectively wreck a trek and it may mean a painful, slow and potentially dangerous hobble back to the base camp. 3. Non cotton pants and full sleeve t-shirt. Cotton is best avoided on a trek. This holds true for the Himalayas and especially for monsoon treks in the Sahyadri. Cotton or denim gets excessively heavy when wet and does not wick and insulate as well as wool or synthetic clothing. Read more on why cotton should be avoided while trekking in our essential clothing article. Most people prefer shorts and t-shirts as their trekking attire during the monsoons, but we tend to deviate towards a full sleeve t-shirt like Tech Fresh 50 (buy at Decathlon India) and a convertible, quick drying trekking pants like Forclaz 50 (buy at Decathlon India). Full sleeve t-shirts and pants provide better protection from stinging nettles, thorns, sunburn and they are more effective against mosquitoes and other critters on a monsoon trek. Remember that clothing is your first line of defence against inclement weather, falls and scrapes. Trekking pants bears the brunt in a slip at Peth/Kothaligad. The same slip in shorts would have frayed skin. Note the square (ripstop) weave that restricts cuts in fabric to individual squares. 4. Lugged shoes that ventilate well. Shoes are the most important piece of gear on a wet and slippery monsoon trek. 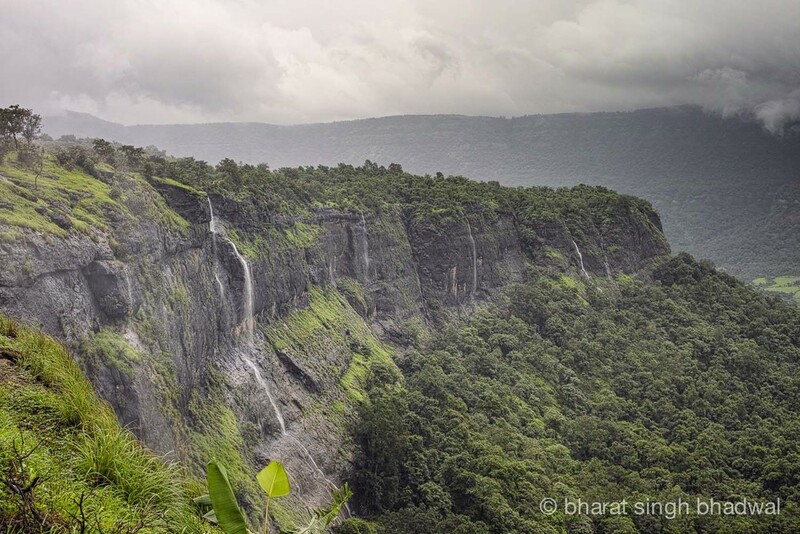 The Sahyadri and Western Ghats are notoriously unforgiving on shoes. During the monsoons the terrain ranges from wet rocks, red mud slush to wet vegetation and roots. None of these surfaces offer a good shoe grip and thus the shoes that you choose need to compensate for this lack of grip. Just like Mud Terrain tyres on off-road vehicles, we recommend shoes with oversized (at least 5 mm) and aggressive lugged outsoles. This is because on a shoe with smaller lugs, the mud trapped between the lugs turns the outsole into a flat and therefore slippery surface. Agressive lugs resemble an off road tyre and provide excellent grip in mud. We maintain that despite the marketing propaganda there is no such thing as a waterproof shoe. Shoes made of waterproof materials like Gore-Tex or coated with hydrophobic materials may resist water ingress better but it also reduces their ability to vent perspiration and the take a longer time to dry. In a humid environment like the monsoons, you want a pair of shoes with lots of ventilation to avoid clammy and thus blister prone feet. Trail running shoes with a synthetic mesh upper and an aggressive outsole like Salomon’s Speedcross 4 are better suited for a monsoon trek. 5. Taking good care of your feet. Using a thin pair of socks, because thicker socks hold moisture. Changing socks at least once during the day. Applying Vaseline to your feet before going off to sleep. More on monsoon foot care tips in our comprehensive article. 6. Jungle orienteering and whiteout. Learning to use a compass and paper maps may save your life one day. Orienteering through a dense forest comes with its own set of challenges. The forest canopy means a GPS may lose signal and the dense overgrowth means visual landmarks cannot be easily identified. In such a situation learning to orienteer with a compass and paper maps can be invaluable. Another potential orienteering hazard is a whiteout on a plateau over 500 metres. Cloud cover can significantly reduce visibility and make recognising physical landmarks difficulty. On the flip side, a whiteout does not affect a GPS's functionality. Read our in-depth review of Garmin's Etrex20x GPS Unit. Therefore always supplement electronic orienteering gear with paper maps and compass and vice versa. If you feel you have strayed from your intended path, follow the STOP technique (read our article on STOP technique). Use a baseball cap. In the rainstorm a baseball cap’s bill keeps the rain off your eyes or prescription eye glasses. Pack frequently used items outside the pack. Every time you open your pack, a bit more rain will get in. This moisture builds up and will probably stay with you for the rest of the trip. To minimise this, store all your regular snacks and heavy-use knick knacks in pockets or on the outside of your pack. Carry extra water or a portable water filter. High humidity means you will sweat more than usual. Make sure to carry extra water supply or a water filter like lifestraw (review here) that can convert a non potable water source to a potable water source. Touch screens don’t work when wet. It is difficult getting a touch screen to work when it is wet or with wet fingers. A phone and GPS with physical buttons / keyboard is better off in the rain than a smart phone with a touchscreen. If you have to use a touchscreen, carry enough microfibre rags to wipe the screen and your fingers. Views like this make getting wet worth the discomfort. One of the most important factors to having a good time during a monsoon trekking trip is having a positive attitude. If you’re mentally prepared to be wet and still have fun, you’ll probably have a great time. One concept that’s tough for beginners to accept is that, if it rains for an extended period of time on your trip, you’re going to get wet, and there’s really no avoiding it. However, if you do choose to brave the wet weather you will be rewarded with some awe inspiring views, lush greenery, mist and numerous waterfalls. So go out there this monsoon and seize the moment. Share you monsoon trekking tips and stories with us in the comments below.